Click on the photos for expando-shot. The larger trees are noted for their red bark and wood. Otherwise there is nothing notable about them except for the fruits (see photo above) which appear in late summer, and drop throughout the fall. These trees were commonly planted as living fences along farm roads and lanes, so if you are hiking through such land be on the lookout. I have left these descriptions vague so you will have the fun of finding the trees for yourself. 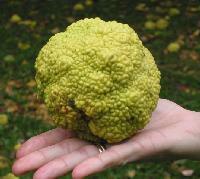 In Wilmington proper there is one good osage orange that I have found. It is just outside Brandywine Park, at the south end of Augustine cutoff, in a little triangle area. 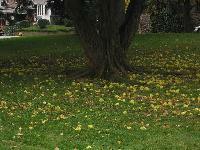 This is the tree in the photos above - it regularly produces lots of fruit, which are great for bowling and throwing. 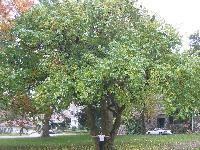 There are several fruiting trees in the town of New Castle, in the park along the water. 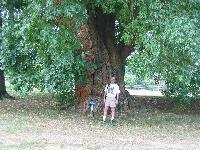 There is a huge tree on the Hagley Museum grounds - this one is the largest in the state at nearly 8 feet in diameter. It is a male, though, so no seeds. There is a row of trees on Thompsons Bridge Road just southwest of the bridge over the Brandywine (near where the spring used to flow out of the springhouse, if you are old enough to remember this) as you start to climb the hill. I have seen several rows of trees when hiking with friends in White Clay Creek State Park, through the sections there that used to be farmed, along some of the old farm lanes. These seeds are very easy to grow. The fruits can be gathered as soon as they hit the ground, and torn apart to find the seeds (they look like orange seeds). The easiest way to get the seeds is to let the fruits sit in a plastic bag outside over the winter; when the fruits rot they are much easier to tear apart. (In 2007, I left the fruits in a bag, and in the spring they were so mushy I just dumped the whole thing into a strainer and stirred it under flowing water until only the seeds were left.) They are pretty nasty after rotting all winter, though; definitely a project for outside. The seeds will germinate promptly when planted in the spring. 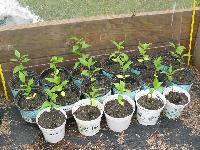 I have also collected seeds in the fall and held them in ambient temperature in a plastic bag. No scarification was needed. The seeds just need to be placed about 1/4" deep in potting soil and kept moist; they usually germinate in about 3 weeks. I have always had a very high germination rate, nearly 100%.